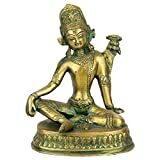 In Hinduism, Indra, also known as &Sacute;akra in the Vedas, is the leader of the Gods. Indra is also the Lord of Heaven (Svarga, also known as Svarga Loka). Indra is also said to be the God of Rain and Thunderstorms. In Jainism, Indra is known as &Sacute;akra, Sakka, or Saudharmendra. In Buddhism, Indra is usually known as &Sacute;akra or Sakka. In China, Korea, and Japan, Indra always appears opposite Brahma, and the two are revered as protectors of the historical Buddha. Additionally, some Buddhists regard the Taoist Jade Emperor (the ruler of heaven) as an interpretation of Indra. in the Zoroastrian religion, Indra is the name of a Daeva (a being of shining light) (although Daevas are considered supernatural beings with negative characteristics). 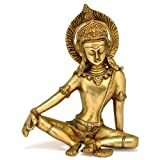 Indra is sometimes described as golden-bodied. Indra wields a lightning bolt (vajra) and rides a four-tusked white elephant (Airavata). Indra can be depicted with four arms or with two. When depicted with two, he holds the vajra and a bow. When depicted with four, he also bears two lances. Indra is said to live in Svarga (heaven) in the vicinity of a sacred mountain (Mount Meru). His court is said to be inhabited by deceased warriors who live without sadness, pain, or fear. Indra is a Vedic deity in Hinduism a guardian deity in Buddhism and the king of the highest heaven called in Jainism. His mythologies and powers are similar, though not identical to those of the Indo-European deities such as Zeus, Jupiter, Perun, Thor, and Odin (Wotan). He is the god of the heavens, lightning, thunder, storms, rains and river flows.His importance diminishes in the post-Vedic Indian literature where he is depicted as a powerful hero but one who is getting in trouble with his drunken, hedonistic and adulterous ways, and the god who disturbs Hindu monks as they meditate because he fears self-realized human beings may become more powerful than him. 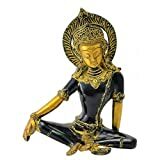 This masterpiece has been craeted by mastercraftsmen of India using brass and cold casting technique. 4 inch height x 10.8 inch width x 4 inch depth. 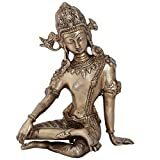 Brass sculptures: buy Ganesha, Buddha and Nataraja sculptures. Product of Exotic India.